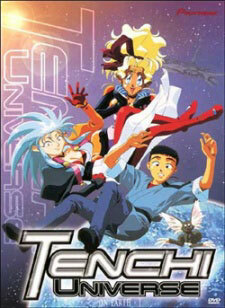 Watch Tenchi Universe Episode 3 English version online and free episodes. Anime Episode guide, Chapter Tenchi Universe Episode 3 English dubbed Long Distance Lunacy Having finally figured out how to block off his end of the dimensional tunnel, Tenchi looks forward to getting some peace and quiet- but the girls see things quite differently! Upset at not being able to drop in on Tenchi whenever they want, Ryoko and Ayeka persuade Washu to set a network of video relays so that they can keep an eye on him! But when a demon reprograms the network to give misleading images, the girls get confused. Could Tenchi really be on top of a cliff with a hippo and a cow? Or, worse yet, could he be off having fun with his ‘true love’?